rec. Spring 2015, Koepelkerk, Renswoude, the Netherlands. Fritz Kreisler became a household name as a violinist through his recordings in the early part of the 20th century. He straddled the transition between acoustic and electric recording processes, widely disseminating and popularising a wide variety of music, usually within the limitations of each side of a 78rpm record but also in concerto repertoire that demanded the juggling of multiple discs for a single work. The Naxos Historical label has an ongoing remastering project which restores these early tracks to the best quality to be found in those old record groves, also of course including the numerous arrangements made by Kreisler, here studiously avoided. What this recording represents is the great violinist’s output as quite a prolific composer. 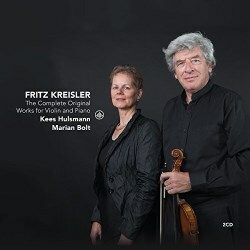 This double-CD set brings together Kreisler's entire original works for violin and piano. Many of these are 'in the style of', and all are very easy-listening. We're not expecting depths of profundity or startling originality here, but there is nothing wrong with that. Of the 'Baroque' pieces, Kreisler famously pretended to have discovered manuscripts by Corelli, Vivaldi, Couperin and others in a French monastery, later admitting that he had written the music himself. Virtuoso display is not always to the fore in these pieces, but titles such as the Gypsy Caprice give performers the chance to fly around the fingerboard. Many tunes are shoe-ins as salon 'hits', and numbers such as the Preghiera in the Style of Martini have a poignant song-like quality that would suit any palm-court tearoom. Kreisler at times could turn his hand to intriguing harmonies, and the Berceuse romantique Op. 9 has a set of progressions that have distinct impressionist tendencies. Some of these pieces are famous in their own right, such as Schön Rosmarin which will have most people nodding in pleasurable recognition. This is followed here by one of the more substantial of these pieces, Episode, which creates a fine dramatic narrative of its own. Kreisler connoisseurs will be intrigued to see a premiere recording of something called Song Op. 6 that appears never to have been released either by Kreisler himself or by anyone else since. The musicians here have followed as far as possible Kreisler's own notes with regard to bowings and finger positions, though Kees Hulsmann doesn't go out of his comfort zone in attempting to recreate Kreisler's own Viennese sound. This was characterised by a particular tight vibrato. It was quite ubiquitous, but by no means so broad as to distort the notes – it was more like that expressive colour to the sound you will find amongst singers. Hulsmann's natural playing style is similarly colourful, but as with most players his vibrato has more variety, and the option of relaxing at transitions or the ends of phrases. The elegance of Kreisler's phrasing and dynamics are still of a uniquely exceptional quality and his musicality and technique goes far beyond vibrato alone, but his sound is very much of the period. Recordings of Kreisler's arrangements and compositions can be found in several more or less recent recordings, with big collections such as Oscar Shumsky on Nimbus (review) providing competition for this release from Challenge Records. Most programmes are, however, mixtures of arrangements and original pieces, and this complete overview of Kreisler's compositions for violin and piano is a great place to revel in the delightful world of his creativity.